For the last couple months we have been on the look out for a cool bedroom set for our youngest. Before he arrived we slurged on a awesome loft bed for his brother and now that he is ready for the transition we want to do the same for him. During a moment of dreaming, I came across this collection by Italian furniture company Battistella Klou XL. Created for kids and teens, these bunk and bridge designs are everything a child could ever want in a bedroom. They offer ‘a kaleidoscope of solutions that reconcile space requirements with delightful visual appeal’. An unstoppable whirlwind of offerings for kids’ bedrooms to make full use of the available height, leaving room for play, to avoid complications. The Klou line offers an extra-large range of options and has been conceived specifically to meet the furniture needs of children of all ages, from toddlers to adolescents, and even adults still living at home, while also providing bedroom furniture for the holiday home. 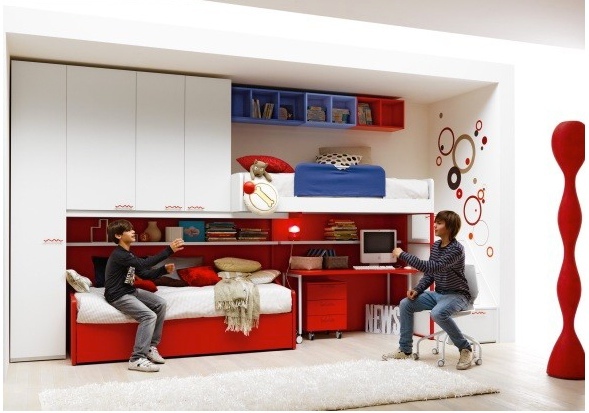 An extra-large range of kids’ bedrooms furniture, colours and ideas to fit out the spaces that kids call their own. I am in love. Along with bold accent walls that compliment these functional spaces perfectly, Battistella also uses puzzle like pieces as bed rails, cabinets and shelving units. These beautiful spaces aren’t just the coolest places for bedtime or studying, but they could definitely set the scene for some pretty awesome sleepovers! Not currently available here in North America, these designs can definitely serve as inspiration when you are putting together your child’s room. These rooms show us that even the smallest spaces can be filled with shelves or cubbies to keep all of kid’s trinkets organized.